Buying best airsoft masks in airsoft sport is always the best possible way to have a competitive edge and represent yourself differently. Airsoft guns can do some serious harm if proper safety measures are not taken. 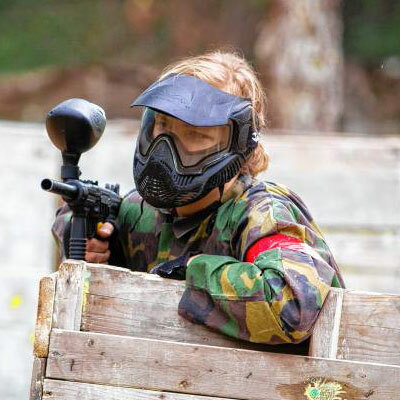 As well as their serious professional and realistic looks, best airsoft masks can provide protection of your face and especially your eyes from any harm or damage during an airsoft game. While some products are clearly better than others, personal preference and different opinions is an issue that plays roll in choosing the best airsoft masks. The following seven face masks ensures the best performance – and the best protection. Keeping your face cool, hidden and secure from the opponent in game is always the most important aspects when considering for a airsoft mask. When to play airsoft or any other outdoor game requires use of a mask, and that’s what the OutdoorMaster Full Face Mask aims to reach. Using the OutdoorMaster Full Face Airsoft Mask with Metal Mesh Eye Protection is a fantastic way to look cool and at the same time feel highly comfortable. Made of 100% of synthetic resin material construction, the inner portion of this mask is layered with very soft rubber cushion around the cheek and chin bones, delivering superior comfort. About secure fit, the OutdoorMaster Full Face Airsoft Mask with Metal Mesh Eye Protection features six adjustable elastic straps at the top, middle and bottom areas, which is one of the highest straps number in the market and can truly ensure that the mask will never slip off while running or jumping around the battlefield. The hard rubber and plastic mixed design of the shell will save you from airsoft BBs. The eyeholes of the mask are made of black metal mesh which dramatically enhances the vision and delivers secured protection for your eyes. Q: Does it protect ears? Q: Can you wear a helmet with this? Q: Can you wear eyeglasses under it? 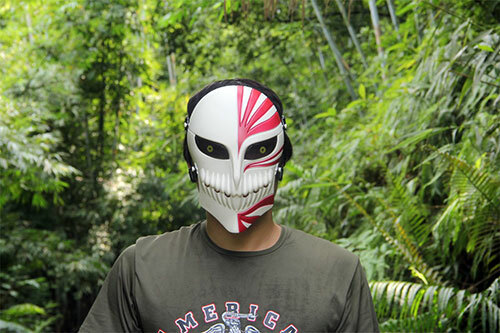 Another unique design mask from OUTGEEK, that earned a spot in our list, looks cool and is worth every penny. The mask is good for beginners for utmost safety, particularly with the metal mesh, which is good and can easily be molded to fit that face of yours. As per the name goes, the OUTGEEK Airsoft Half Face Mask Steel Mesh and Goggle Set is the type of mask that is made to protect those essential parts of the face, meaning it is not a fool-proof complete mask like it’s another best-selling product, the OUTGEEK Tactical Airsoft Full Face Mask. Made of a low-carbon steel design, the material used in making this mask is durable and attached with an ABS Plastic Goggles for full eye and face protection. The Skull of the OUTGEEK Airsoft Half Face Mask has two adjustable elastic straps which enhance better fit for any sixe of heads. Another major feature of this mask is that you can easily and gently fold it to fit your face accordingly while amazing air ventilation design single-handedly prevent fogging in the mesh part of the mask. If you are looking for something that will improve your game to the next level, this is the best airsoft masks for you. Provides protection to BBs under 310 fps in 5 meters. Elastic adjustable elastic strap for a better fit. Perfect for milsim and airsoft activities. Q: Can you wear my glasses with this? Q: Does it come with 4 sets or just 1? Q: Do the mask fog up? 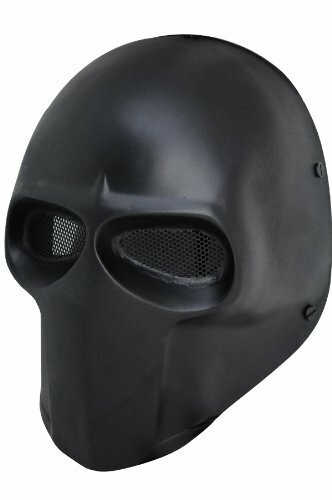 The M01 Army Skull Airsoft Mask from Coxeer is one that provides very well in airsoft games with utmost comfortability and because it is adjustable, both young and old and people with any kind of face size can use it as it provides an adjustable fit. The Army M01 Skull Skeleton Mask is a full face mask with all those features to ensure 100% safety effectively. The material used in making this mask is environmentally-friendly, and is of top quality, doesn’t smell and poison-free. Q: Is it a metal mesh? Q: Can you wear glasses underneath? Q: Can it be used for paintball? Good for airsoft, Halloween, and more outdoor activities. We know Coxeer is a reliable brand because that manufactures products made out of top quality materials, so we didn’t think twice in selecting this amazing mask. The mask provides a perfect fit, is durable and comfortable to wear. Above all, this mask is odorless and free from any kind of poisonous material. 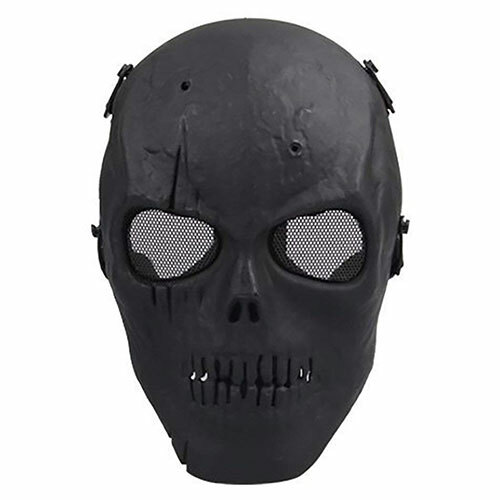 The Coxeer Tactical Airsoft Mask Overhead Skull Mask Outdoor Airsoft Mask is the type that packs a cool and stylish design and highly blends with the any kind of airsoft costume. The mask’s construction and straps ensures that it can fit well on both adult and minor face. The material used in making this mask is mainly quality plastic while the eye area features black metal screen design for extra eye security. The material is extra thick, reliable and will protect your face in any hostile condition held during an airsoft game. The Coxeer tactical Airsoft Full Face Mask also gives you that tactical advantage with ease of adjusting the straps to become tight or loose, just the way you want it wear it. The inside of the mask houses comfortable padding on the nose, cheek and forehead areas for a very relaxing performance. There are a lot of holes in the mask which increases breathability while enjoying the complete face protection offered by this mask. Q: Does it work on glasses? Q: Is the eye mesh replaceable? Another extra ordinary product from Outgeek! This mask is a high-quality one, letting your eyes to see clearly. The Outgeek tactical Airsoft Full Face mask gives the player that unique and useful look when battling ‘friendly foes’ in an airsoft game. 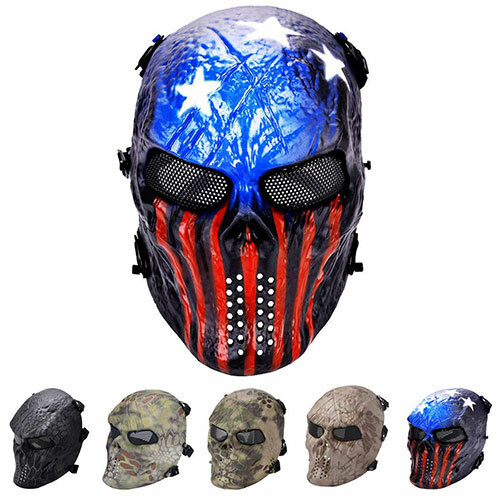 Coming with a thermoplastic polyurethanes material construction, the OUTGEEK Tactical Airsoft Mask Full Face Costume Mask is very stylish and highly durable. It is one of the most preferred tactical mask you can blindly trust. The mask features rubber padding on the inside of the cheek and forehead, and also very comfortable that you can hardly feel the existence of this mask on your face. The solid design of the mask makes it capable of withstanding and absorbing impacts even from airsoft grenades. The mask comes with 3 pairs of adjustable straps that help in balancing and keeping it on your face while running or jumping around the field. Q: How good is the field of vision on this mask? Q: Can you use it for paintball? Q: Does it restrict aiming? This is a professional Full Face Mask from FMA—a reliable brand widely known for manufacturing high-end outdoor products around the world. The New Black Wire Mask Provides full face protection with careful, user-friendly and stylish design. Other features behind the reasons of choosing this mask are discussed below. FMA’s New Black Wire Mesh Full Face Mask is a very durable mask that has a powerful resin-glass fiber composite as the manufacturing material. The mask is designed to achieve full face protection, and it features elastic and adjustable belt strap that holds the mask in place without any chance of sleeping off. So when the full power of an airsoft rifle hits you, this New Black Wire Mesh Full Face Mask is there to secure you from the hit. The eye area of the mask is protected by a special metal mesh design, while the inner part of the mask includes comfortable cushion pads. The design also leaves quite a space between the mouth and the mask for easy breathing and ventilation. Q: Can you paint different colours afterward? Q: Can this fit with glasses on? Q: Is the mesh removable? 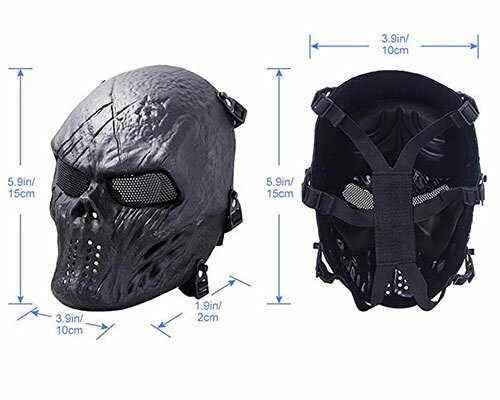 If you are looking for a full face protective tactical mask to withstand those fierce shots in airsoft, the CCTRO Airsoft Skull Full Face Mask is here to give you the upper hand. Apart from being scary and different from other choices, there are some other major reasons behind choosing it as one the best airsoft masks. 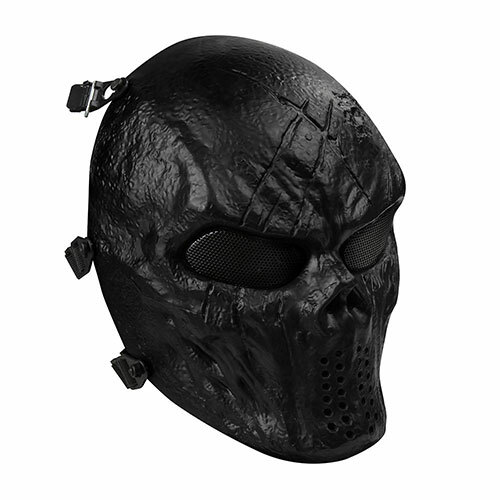 The CCTRO Airsoft Skull Face Mask is a full face mask that provides total full facial protection while rocking high-quality engineering construction with high-quality fiber material bearing solid foam padding. The material design of the mask is odorless and completely free from any kind of toxic or poisonous items. The CCTRO Airsoft Skull Full Face Mask is lightweight and features elastic straps that are adjustable for better comfort and perfect fit for players of any age. Soft foam is attached to the nose area leaves a comfortable space making it easy to wear and to breathe. The mask also features metal mesh eye protection as other best airsoft masks in the list that enhances perfect vision and good look. Q: How well can you be heard through the mask? Q: Can you wear a helmet with it? 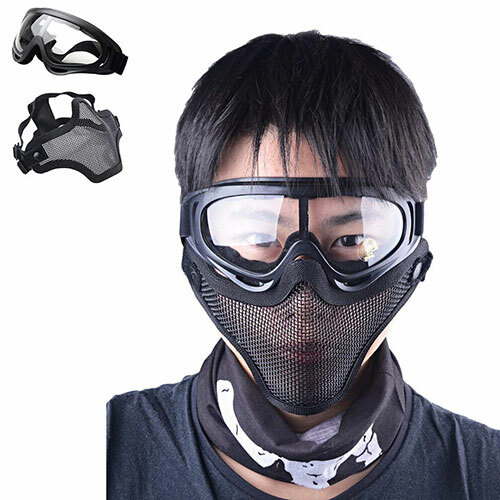 Normally there are two common ways of protecting your face and eyes during airsoft game, first of these, and the most common one is a single full face system which will include both face and eye protection. In other cases, players choose to use ballistic glasses or goggles along with a separate piece for protecting the lower portion of the face. The only real disadvantage to using a full face mask over a half-mask is that sometimes it can be tricky to align properly along with your weapon’s stock. In order to coup with this problem, some of the best airsoft masks is the solution here. In this article, we did all our best to pick the top quality masks that are with proven quality and earned top consumer rating. We went through a variety of masks and realized that most of them are pretty good due to how serious the community is about safety. There’re a few other things to consider here in order to ensure you get exactly what you need. Learning how to choose the right one is key. Faces come in all shapes in sizes so it’s impossible to think of any kind of mask without having a proper strap system. It will let you know how many stages of adjustability are featured and if you feel comfortable with any of those options. Confirming several straps will surely increase the chance of getting an ideal fit. The best airsoft masks come with at least a minimum of six straps so no customers feel left out. This is smart way of attracting people because they get more sales by doing it. The more number of straps, the better. Making sure your mask has vents is a must and should be on the top of priority list. The most common issue that occurs is fogging when the air circulation is hampered from inside. Having a proper vent along with a good quality anti-fogging and ventilation will allow you to see without any doubts and full confidence. Overheating is another from that originates from poor ventilation system, which can cause your face to get sweaty and you will not want that for sure. Don’t forget to inquire about the size of the vents because they must have be tinier than the typical smallest 6mm airsoft pellet so that the projectiles cannot get through the inside of your mask. Safety is THE most important aspect to remember in airsoft and a huge part of safety involves having the proper kind of eye protection. Eye protection is by far the most important (and must have) piece of safety equipment you need at an airsoft game. While your skin may bruise or cut, it generally heals without long term effects – the same cannot be said for your eyes, and it can take serious life-long damage. Most players spend so much on rifles but skip on this basic yet the most most important protection part. Spending that extra money for face protectors like masks can reduce the risk (and cost) of losing an eye or tooth drastically. It is important to feel good about the way of how your gear performs but not many people realize how important the way it looks is to the equation. A piece of gear that can represent a player’s nature and personality with various design and symbols should definitely have more attention. The majority of players make buying decisions based on their personal emotions and how a particular product makes them feel. Design aesthetics plays a big role when it comes to best airsoft masks. Logging for aesthetics is fine as long as you don’t forget that safety should always be the primary target in the list. While getting hit on your legs or chest is painful, any direct contact with your face could lead to permanent injuries and serious damage because of how delicate and crucial that part of our body is. That’s why masks should be a matter of careful consideration. There are many models, shapes and sizes out there, at different price point but what you need here is the quality and not just the looks. Items described above are some of the best airsoft masks. We know it’s not so easy to find the best or guarantees our picks to be the best as there are so many different choices available on the market, but we believe that our list of best airsoft masks above will help you make a better decision. Once you know the kind of performance you are looking for, you can consider how the available options fit your needs and make your decision based on that.